CANTON – The number of St. Lawrence County children placed in foster care has jumped 21 percent in less than two years, according to the county Department of Social Service. Drug addiction, including heroin and other opioids, is still the primary reason for the majority of cases of St. Lawrence County children living in foster care, according to Heather Wenzel, deputy commissioner at St. Lawrence County Department of Social Services. “Many of the families that we are involved with are struggling with addiction,” Wenzel said. The number of children in foster care has grown drastically since an article in North Country This Week in 2017. 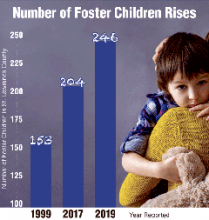 There were 246 children in foster care as of Jan. 31, 2019 compared to 204 in 2017. That is an increase of 21 percent. The number of Child Protective Services reports has increased in the past two years as well. To help address the increasing number of child abuse cases, St. Lawrence County lawmakers approved creating another caseworker position, as well as a caseworkers assistant. This is on top of filling two social welfare examiner positions and a social welfare investigator job that had been unfilled. “We have a group of passionate, dedicated professionals who spend as much time with families as possible while balancing their in-office work,” Wenzel said. It is the goal of social service workers to keep the child in the home, or with family members, before turning to foster care. “We are doing our best to expand and improve preventive services to work with families before foster care placement is needed,” she said. Whenever possible, social service workers collaborate to identify family members and other informal supports that can provide assistance when families are struggling. “We are focused on trauma-informed training for our staff and partner service providers in 2019,” Wenzel said. A shortage of detox beds, especially for women, is leading to longer wait times for people to get clean and be reunited with their children. “There is a shortage of services, including detox beds and inpatient rehabilitation treatment in St. Lawrence County,” Wenzel said. Social services partners with a variety of service providers to assist individuals in locating appropriate programs as quickly as possible and to navigate insurance and transportation when issues arise. Social services continuously recruits foster care homes. Families, for example, that are able to accept larger sibling groups and children with unique needs are essential. “When foster families are well matched with the children that are placed in their home, we see better outcomes for both our foster families and the children and families we are serving,” Wenzel said. If an individual or family is interested in becoming a foster care home, they can reach out to social services at 315- 379-2190. Caseloads for Child Protective Services and child preventive, foster care, adoption services caseworkers vary. As of March 1, the average caseload size for child welfare caseworkers in St. Lawrence County is around 20. Employee recruitment and retention for these positions is a challenge not only in St. Lawrence County, but across the state and nation. “Our caseworkers regularly respond to challenging situations and experience secondary trauma from their work. We do believe that lower caseloads support better outcomes for children and families and would like to see caseload sizes reduced,” Wenzel said. Caseworker examinations are scheduled regularly as well as for other entry-level positions in child welfare. “Caseworkers are a vital part of our child welfare team and although it is challenging work, it is also incredibly rewarding,” Wenzel said. Those interested in a career in child welfare can visit www.stlawco.org/Departments/HumanResources/ for upcoming examination announcements. “We could always provide more intensive preventive services with additional staff. We rely not only on our staff within the Department of Social Services, but also on a network of provider agency partners to assist in our mission,” Wenzel said. Volunteers are also needed to provide supervision and transportation for family visits. Volunteers receive training and reimbursement for mileage at the IRS rate. For more information about volunteering with the St. Lawrence County Department of Social Services, call (315) 379-2195.